To study all components used in Air Conditioning system. To study the Vapor compression Refrigeration cycle. 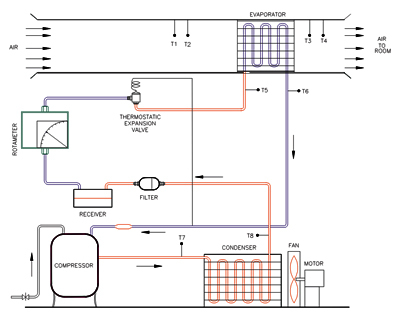 To determine the Refrigeration Effect, Work Input, Actual C.O.P., Carnot C.O.P., Theoretical C.O.P., Relative C.O.P., Ton of Refrigeration, and Plant Efficiency. Compressor : Hermetically sealed compressor. Condenser : Air Cooled condenser made out of copper pipe & Aluminum fins of matching capacity with fan cooling. Evaporator : Air calorimeter type evaporator. The air passed by a fan through duct. The expanded refrigerant passes through evaporator coils, fixed in the duct. The passing air comes in contact with the coils & gets cooled. Expansion device : Thermostatic expansion valve. Energy Meter : For power measurement of compressor. Hand Shut Off type Service valve. Rotameter for Refrigerant flow measurement. Duct : Air duct in which evaporator is fitted. Blower : Suitable capacity blower with air control arrangement. HP-LP Cutout : Make Ranco /Danfoss or Equivalent. Switches : For compressor, condenser fan & blower. 1.5 m. (L) x 1.0 m. (W). POWER SUPPLY : i. 440 V. A.C., 50 Hz.